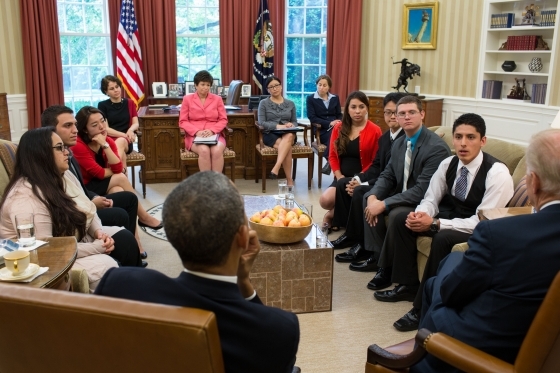 May 21, 2013, 12:29 p.m.
WASHINGTON — President Obama met Tuesday with young immigrants and others who expressed their fear that family members will be deported and their hope that Congress will pass new immigration laws to keep families intact. Obama urged the group to share their stories on Capitol Hill as the Senate Judiciary Committee prepared to send an immigration overhaul bill to the full Senate for consideration. Mehdi Mahraoui, who was born in Morocco and came to America when he was 7, told Obama he worries that his parents and eldest sister will be deported. He is a legal permanent resident and his 8-year-old sister is a U.S. citizen, but the other family members are not. If his parents are forced to leave, he would become sole caretaker of his little sister, he told reporters after meeting with the president. Plans for the visit came together over the weekend, some participants said. An advocacy group, the Fair Immigration Reform Movement, arranged for seven young immigrants to tell Obama how immigration laws have affected their families. The meeting reflects the dilemma Obama faces as he seeks congressional support for immigration reform. If he pushes too hard or gets too personally involved, aides say, he could alienate Republicans who don’t want to be aligned with the Democratic president on anything. As a result, Obama has sought to drum up support in campaign-style events around the country, and tried to direct the spotlight toward people he thinks are more convincing to lawmakers than he is. So it was that the college-age immigrants were in the Oval Office on Tuesday, practicing their public speaking with the president and then speaking with members of the White House press corps. Several visitors said they got choked up as they told him their family history. The president reached out to hold one young man’s hand, and then advised him to repeat his heartfelt account for lawmakers.